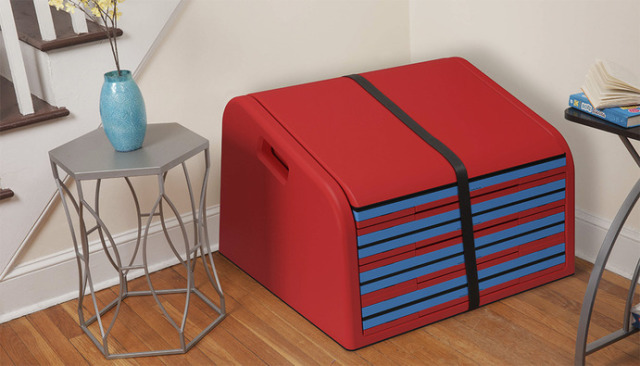 Complete with side bumpers and a cushioned landing for safety, SlideRider is a collapsible slide for kids that can easily be stacked and stored when not in use. It’s also weighted at the top and bottom to ensure it stays in place. When I first looked at the pictures, I wasn’t sure how I—I mean my kids—would get back up after sliding down, but it looks like there is enough room between the side of the slide and the railing or wall to get back up once you slide down. Submitted as an idea to Quirky , a place that turns ideas into products, by inventor Trisha Cleaveland, SlideRider is now being priced by Quirky’s community of inventors and members. SlideRider also needs a manufacturer to turn it into a mass-produced product that can be brought to store shelves and online retailers like Amazon. 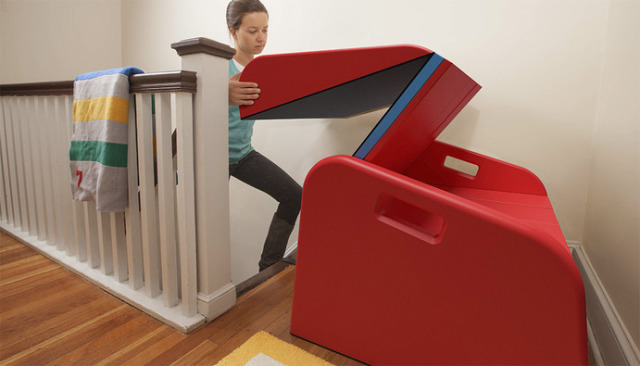 I hope this brilliant invention is available soon because just like my favorite toy growing up was the staircase, my kids seem to be drawn to the stairs too. My almost walking twin boys are drawn to them like…like babies to stairs, and my toddler loves to climb up the banister as if she is a mountain goat scaling a cliff. Instead of chasing my kids off of the stairs, I would love to be chasing them to the stairs to be the first one down SlideRider. I’m not positive this indoor slide will be meant for adults, but I make no promises I won’t try it. 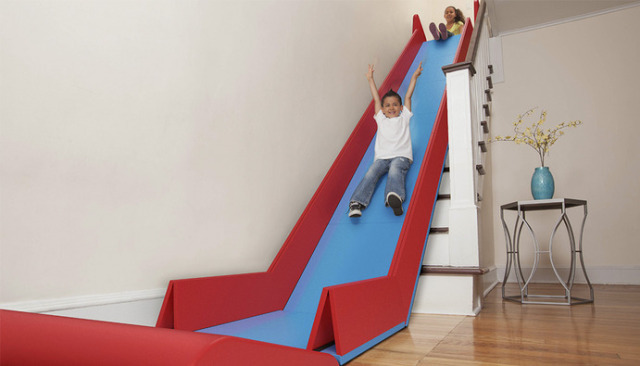 Unfortunately, this indoor slide was not successfuly launched into the marketplace. If you'd like to see some of the new products Quirky has successfully brought to market, you can see them here. If you look at the SlideRider’s project on Quirky, it notes that this is a legacy invention and no longer actively being developed. So if you want a slide for your staircase, you will have to settle for making one yourself. Contemplative Creatures made their own DIY Homemade Cardboard Staircase Slide. 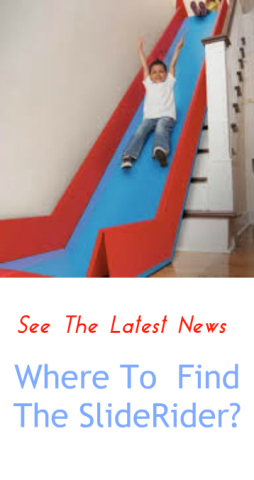 The hardest part about making a cardboard slide for your home will be collecting enough large cardboard pieces to make the slide. If you ask at your local store that sells appilances like a Best Buy or Walmart (just go to the back work entrance to the store where the workmen are or ask to see the manager, you should be able to get some boxes there. Once you get enough boxes, just tape them together with duct and make sure to tape the top of the carboard adequately to attach it to the top of the stairs. Remember to use lots of pillows for cushioning. 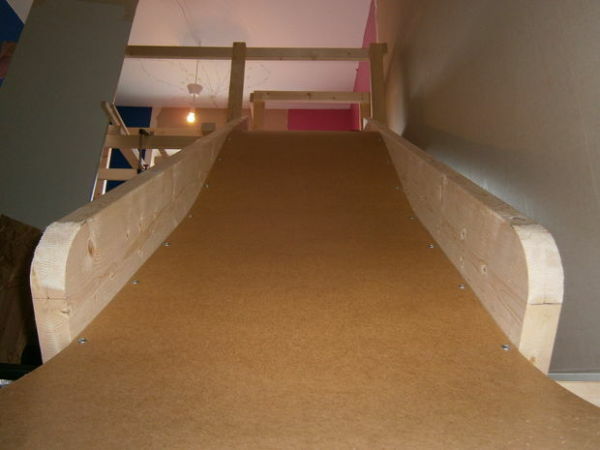 If you want to create less temporary indoor slide for your home, Instructables has a nice set of instructions fo how to make an indoor staircase slide for your home from plywood. AWESOME! why didn't we think of this? Thank you! Let's hope it's ready for purchase soon!